This hand-colored map is a steel-plate engraving, dating to 1873 by the American mapmakers Walling & Gray. It represents the city of Salem Massachusetts. 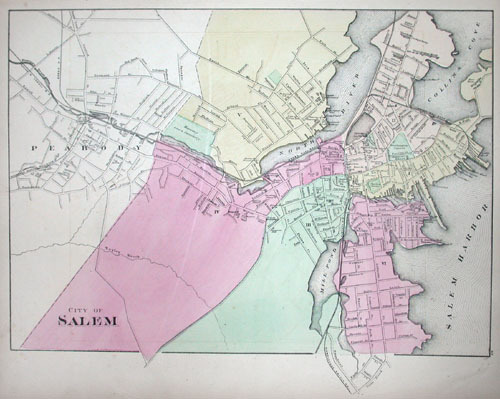 Salem is infamous for the horrifying Salem Witchcraft Trials of 1692. All streets, districts, and even important buildings are carefully noted. Vivid hand coloring, fine workmanship, and extreme detail are the hallmarks of Walling & Gray maps. Walling & Gray are well known for their late 19th century American city and county maps.